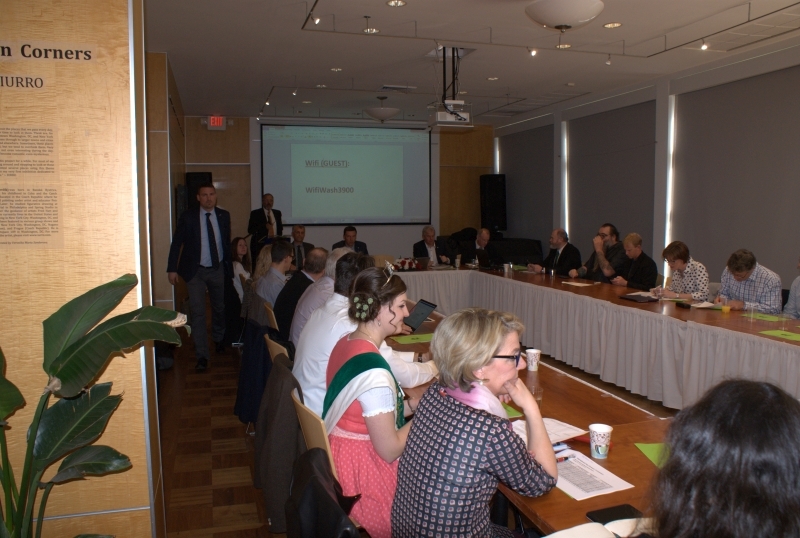 The Embassy of the Czech Republic in Washington, DC in cooperation with Bohemia Hop a.s. and Hop Growers Union of the Czech Republic hosted the spring meeting of International Hop Growers Convention on April 9. 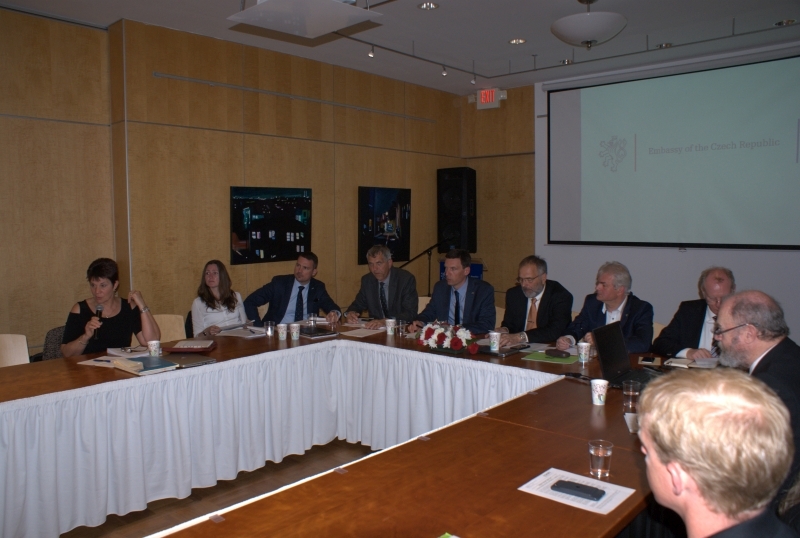 The meeting was attended by 40 delegates from the Czech Republic, USA, Germany, France, United Kingdom, Slovenia, New Zealand etc. President of I.H.G.C. Mr. Leslie Roy appreciated hospitality of the Embassy. Summary report of Economic Committee was updated by 13 member countries. The merchant report also was presented. I.H.G.C. total hop acreage in 2016 crop after correction reached almost 55 thousands hectars, production almost 108 thousands tonnes. The hop area strung for harvest in 2017 are expected higher more than 3 thousands hectars compared to previous year. Delegates from Ministry of Agriculutre of the Czech Republic also joined the meeting. I.H.G.C. delegates exchanged their views on upcoming hop season. The Central Institute for Supervising and Testing in Agriculture (CISTA) announced the official 2016 crop results. The total hop harvest in the Czech Republic reached 7 712 t of hops. This official figure includes Saaz, Auscha and Tirschitz regions. Average national yield was 1,61 t/ha (including all varieties grown in the Czech Republic). It has been historically the best yield for Czech hops since 1920. Czech Hop harvest reached good result after a very poor crop of 2015 where we recorded one of the lowest results in yields and alpha content. The combination of 2015 and 2016 crop gives us an average result which corresponds to crop 2014. The quality of 2016 crop can be regarded as good as the the plant health and slightly above the long term average with regards to alpha acid content. Current demand for Czech hops encouraged growers to increase their acreage. It has led to growing hop area back to almost 5 thousands hectars that the Czech Republic had in 2010. Hops from current acreage have been already contracted to a high level for next few years. Hop Growers Union of the Czech Republic in cooperation with Hop Research Institute in Zatec will exhibit the Czech Hops at BrauBeviale 2016. The booth is supported by the Fund of The Usti Region. Taste the special batches of beer (lagers, IPAs ...) only from czech raw materials. CISTA (Central Institute for Supervising and Testing in Agriculture) released final hop acreage. Total area strung for harvest was 4.775 hectars. This is increase by 153 hectars compared to previous year. The acreage has been growing for the third year in a row. The highest percentage of total surface represents fine aroma variety Saaz (88 %). Other czech varieties have also been rising - Harmonie, Saaz Late or Kazbek (flavour hops). The growers invest not only in a new plantings but in harvesting facilities too.